When most people think of barbecue fare, they automatically think of beer to enjoy with it. 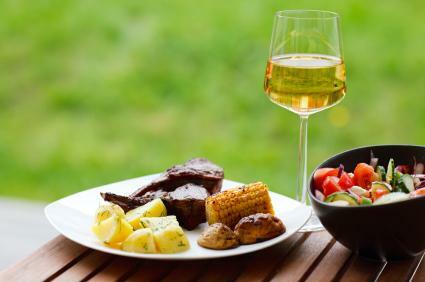 You may be surprised to know that there are number of wines that pair well with barbecue fare. Consider adding a wine to serve your guests at your next outdoor gathering and see if they are pleasantly surprised with how great it goes with your grilled food. Switch things up from the traditional beer and barbecue pairing and replace that beer with a chilled glass of Chardonnay. If white wines aren't your thing, there are plenty of perfect reds that match well with the smoky flavors of barbecue food like a light Pinot Noir or a peppery Shiraz. There is definitely a wide array of wine choices when it comes to pairing one with barbecue fare, so go ahead and try out a few to find out what you prefer. 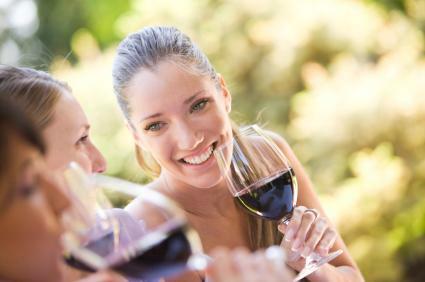 Use a list of popular wines and what they pair best with to get started. Chardonnay: This white works best with grilled fish, shellfish and chicken. It also is great with fresh grilled corn on the cob covered in butter. Look for ones without the oak aging for the most versatility. Riesling: This sweet white works well with barbecue chicken, grilled vegetables, and even grilled pineapple. Pinot Grigio: This dry white wine can be served with grilled vegetables and shrimp. Zinfandel: This vibrant and full-bodied garnet red wine has hints of black cherry and black pepper, making it ideal to serve with barbecue food. Pair it with saucy ribs for a tasty treat. Merlot: This red goes great with grilled chicken, pork, and summer salads. It has hints of fruit that work well with spicy dishes as well. Shiraz: This spicy red is perfect to serve with red meat. Pair it with grilled steaks, smoked brisket, or any smoked meat. Cabernet Sauvignon: This wine has notes that make it perfect to serve with burgers and steak. This deep red can stand up to sharp cheeses and any sauce or condiment. Pinot Noir: This wine can be served with just about anything. It is easy to drink and works well with red meat, as well as fish. It can be served with grilled salmon, beef burgers, and even chicken. If you aren't ready to make the full switch to wine from beer at your next barbecue, consider sangria an alternative. 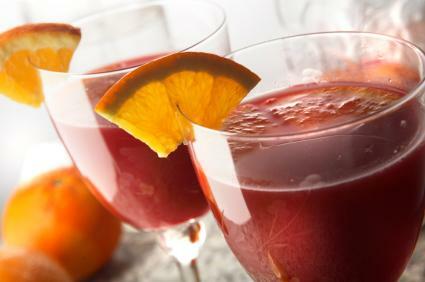 Sangrias are refreshing and incorporate fresh fruit along with wine. They are easy to drink and visually appealing. A sangria is the perfect drink that is sure to please everyone. Try a sangria made with red wine, brandy, fresh summer fruit, and plenty of ice with barbecue favorites such as ribs or chicken covered in barbecue sauce. The sweet beverage will complement the sauce on the meat. Another sangria recipe to try uses white wine, cubed melon such as honeydew and watermelon, strawberries and raspberries. Top it off with ginger ale and you have a drink that will pair well with grilled fish or chicken. 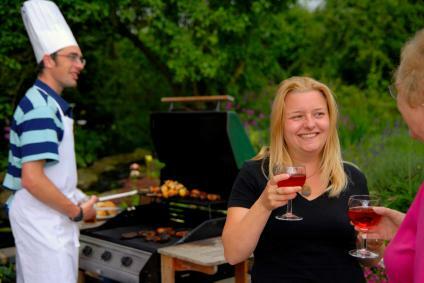 Your barbecue beverage choices should be as varied as the food you offer. After all, you don't grill the same food every single time you have a barbecue, so why serve the same drinks? With a variety of wine choices available that pair well with barbecue fare, it just makes sense to serve some to your friends and family the next time you decide to grill.